One of the joys of playing an instrument is to be able to share the music. But unless you are already skilled at improvising and playing piano by ear, here are some great tips on how you "learn by heart" and keep a short repertoire of pieces to share with your friends any time! 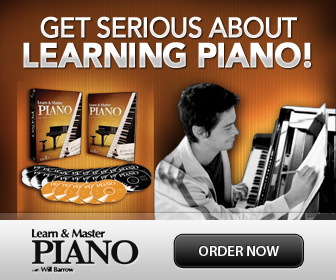 Here is a step by step plan how you can prepare and memorize a piano repertoire. Start by selecting 4 to 5 pieces that are a bit easier than what you would normally play. See if you can find pieces in different styles, to make your repertoire more varied. For a great selection of easier piano pieces, perfect for social events have a look at this collection of piano songs. Yes. Obviously first learn the pieces with notes. Make sure to learn the beginning and ending of a piece first. Why? Well, in a performance that is where the attention is most focused. You can goof up in the middle of the piece quite a lot, but if you finish elegantly all is “forgiven”. Also, the beginning of a piece is like the first impression of someone, so do make sure it is neat and tidy! If the piece has some small tricky technical bits, simplify them. Cut away anything unnecessary (as long as it doesn’t ruin the piece of course) and remember that no one (except you) is interested in you having conquered something really difficult (most people wouldn’t notice anyway) but most will prefer and love listening to, a smoothly performed piece without obvious mistakes. Normally, peoples attention is very short at social gatherings, unless you play a song that everyone wants to sing along with. You usually don’t have to play all variations of Scott Joplin’s “The Entertainer”, for example, or all parts of Beethoven’s “Fur Elise”. On the other hand, some people love the plinkety-plink of the piano as a background sound while talking. In this case is it great with repeat after repeat so you keep on playing for a long time…! 4. Now Memorize Each Piece with a Simple Formula! First learn the piece with notes. Then play 2-4 measures twice without mistakes while really staring at the notes. Play the same part twice still with the notes in front of you, but this time look at your hands and piano keys (you may "cheat" by looking up, but keep your eyes mainly on the hands and keys). Play twice more with closed book (no "cheating") and keep looking at the keyboard and your hands. Continue in the same way with the next 2-4 measures. After learning the whole piece like this, combine larger parts of 4-8 measures, and then even larger. Keep adding parts together until you can play the whole piece by heart. Here is a tool to help you more with how to memorize: How to Memorize Music - A Practical Approach for non-Geniuses. The first week after memorizing a piece, play it preferably several times a day or a minimum of once daily. The second week, play every other day. The third week, three times. The fourth week two times, and then play your piece/s a minimum of once every week as long as you want to keep that piece on your repertoire. As you learn new pieces, you might want to trade old pieces with new- or keep them forever on your repertoire, whatever you prefer. But remember to keep polishing your little repertoire, and grab every opportunity you can to share it with others!